Rural Revolution: What do 5000+ books look like? What do 5000+ books look like? As some of you may have gathered, we love books. We collect books. We have books all over the house, in the oddest nooks and crannies, wherever we can squeeze them. I wrote an article (never published) called Raising a Reader: Confessions of an Obsessed Book Collector which, if I do say so, is a pretty darned accurate portrayal of our family's little, er, quirk. And to answer the most frequently-asked question....no, we haven't read them all. We've read most of them, though - at least 75%. So what do 5000+ books look like? I went around and photographed our bookshelves. We have about half of them roughly grouped into categories. The rest are a mishmash. A heavily-used shelf. Top shelf are interior design, some science series, and some photo collections by Life Magazine; next shelf are costuming (chiefly Renaissance and Medieval), arts, and crafts; next are the comic series (Foxtrot, Calvin & Hobbes, Baby Blues, The Far Side, etc. ); next are our daily-use schoolbooks; and on the bottom, some oversized books involving art collections and mythology. Mostly science books (largely geology, biology), including my cherished "In the Shadow of Man" autographed by Jane Goodall back in 1978; plus a few gardening books and miscellaneous mishmash. A mishmash unit. Lots of novels (Bronte, Seton, M.M. Kaye, Austin) along with absolutely anything else, ranging from Plants of Idaho to a biography of Shirley Temple. One of my favorite shelving units. This holds Childcraft books and This Fabulous Century books at the top; on the left are World Book Encyclopedias (picked up for $1/each when our old Oregon library upgraded to newer editions); left bottom are history books; and the two right-hand units hold my collection of farming, gardening, and homesteading books. A stray shelf built into the boot unit my husband made, next to our entry way. At the top are the cubbies where we tuck hats, gloves, etc. Bottom, obviously, are boots. This shelf holds a lot of our identification books (birds, flowers, insects, etc.) and some overflow mishmash. The shelving unit next to the piano. This used to be a display unit for our tankards when we were doing craft shows. Now it holds a collection of classic literature - Bronte, Twain, Dickens, Aesop, Mitchell, that kind of stuff. A few shorter sets or series as we find them. Our reference shelves, as well as oversized books (mostly art). This unit is at the base of our stairs, and the little radio ($5.99 at Goodwill) is constantly tuned to KAGU 88.7 FM, the classical station out of Gonzaga University in Spokane, WA so I can hear it in my office. Ah, bliss. Shelves in the front room bathroom (that I now use as a canning closet). The lower shelf has books on religion and several spare Bibles; the middle shelf has books on psychology and human behavior; and the top shelf has books on simplicity and frugality. Reference books on a high shelf in my husband's "office" (poor guy doesn't really have a proper place to call his own). These are wiring and plumbing manuals, woodworking reference books, appliance repair, that kind of thing. A typical sight - recently finished (or recently referenced) books piled everywhere. These shelves are on the stair landing right below my office. These are a mishmash - no particular order or theme. These are my writing reference books in my office. One year Don asked me what I wanted for Christmas, and I said I wanted a magazine shelf. We had magazines archived all over the house, and I wanted them shelved all in one place. Many of these are magazines Don or I write for - Countryside, Grit, Backwoods Home, Back Home, Crafts Report, etc. Others are magazines we get at thrift stores or free as library giveaways - Architectural Digest, National Geographic, etc. On the top shelf are two series of books (one on classic sailing ships - my husband used to be in the Navy; and the other an almost-complete Great Books of the Western World set) found at a library sale for - I'm not kidding - $3 for each series. For the whole series. (We thought we'd died and gone to heaven.) You can see something of the unfinished nature of our do-it-yourself house by the insulation above the books. On the other side of this wall is my office. 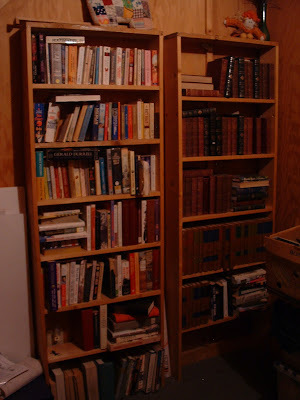 This is our "paperback bookshelf," squeezed into an odd nook outside our bedroom door. Don built these shelves out of 100+ year old barnwood we found in the attic of our old house in Oregon. Some of our series volumes: my beloved Harvard Classics (incomplete - I'm working on acquiring the volumes as I find them) as well as some Great Classics I picked up for a buck apiece at a library sale. The rest is mishmash. The shelves were originally display units for our tankards back in the days when we did craft fairs. Now they're located in a spare bedroom. So that's what 5000+ books look like. Any questions? 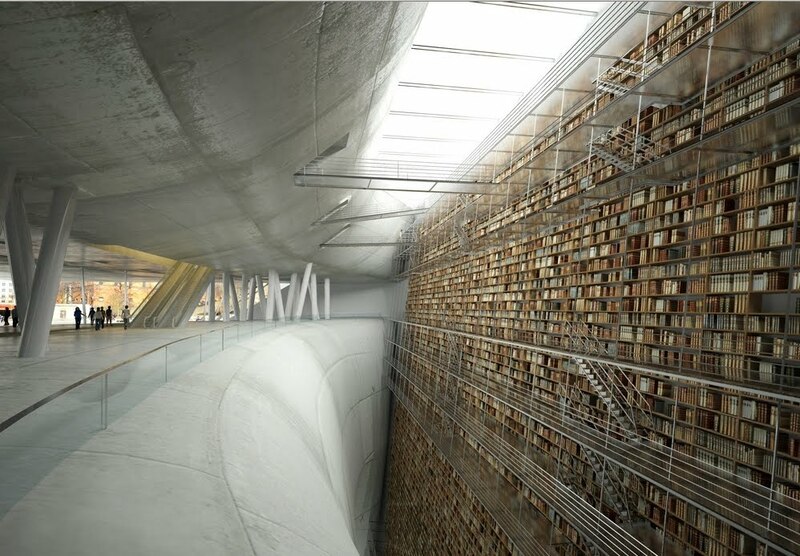 UPDATE: Now here's the Ultimate Library. I wish! My sister has spent a lifetime as a buyer and seller of books both for her own store and then for one of the largest book retailers in this state. She doesn't come close to having this many books in her possession. Wow! I love that I can recognize some of these by the way the spine looks. I too love books and put in book shelves down my hallway. Most of my friends thought I was nuts because it is a narrow hallway. I do have to take the laundry basket sideways down the hall and I probably could not accommodate a wheelchair but it was a great place to store my library. I always have 5-6 on my bedside table and my coffee table is loaded with books and magazines. I love my books and refer to them often. I even take some when I go away to share with friends. Boy I need some shelves! Both of my kids' rooms look like a children's bookstore exploded in there. I love books! Your home looks like HEAVEN to me! I love books also, and have quite a collection. Unfortunately, most of them are in boxes in the garage because I have only one bookshelf that survived our last move (ah, the travails of a military family). My husband keeps hounding me to get rid of some of them, and I keep hounding him to build me some bookshelves. I wish he was more of a bibliophile, or at least understood my position. *sigh* Oh well. You are a woman (and family) after my own heart. Though whereas you definitely get the gold medal, my small house confines me to distant bronze. I commented to someone the other day that if I won the lottery I would walk into the nearest Barnes and Noble and say, "Lock the doors, I'll take it." The last time we counted our books was more than 15 years ago. There were over 2000. We've been afraid to count them again because we KNOW they've multiplied! We also listen to KAGU, but only in the car. We can't get the station at our house & in Colville there's too much static. Yesterday we were listening to the 1812 Overture on the way to Mass. It ended just before we pulled into the parking lot. Good timing, Zags! Wonderful! A home without books is like a body without soul! I haven´t counted my collection, but i am nowhere near 5000! Anyway, i always wonder when i will have time to read them, hopefully when i retire. I just finished M K Wren´s novel "A Gift Upon the Shore", a wonderful story wich might be of your liking. About survival after the SHTF, and where books and their conservation plays an important role. One interesting note - if you notice in television shows from the 1950's or so, often there are bookshelves in the living room of the set. I cannot recall a single modern show doing the same thing. Furthermore, in watching shows featuring modern houses - or people wishing to modernize their homes - I have never seen anybody looking for a library, or even for more book storage, which is sad. One day those electronic gizmos are just not going to work anymore. I realize I'm (very) late to the comment party, but I just found this post and I HAVE TO tell you that those shelves, and all those books, are breathtakingly beautiful to me. I don't have anything like a library of 5,000 books, but I am frequently criticized for having too many. Currently I have 4 commercial 5-shelf bookcases like what can be purchased at WalMart, a 5-shelf CD rack full of "pocket edition" paperbacks, 4 18x18x18 boxes of books plus a complete set of family craft encyclopedias hidden behind the bookcase headboard of my son's bed (my mother-in-law complains, vociferously, about me having too many books to be aesthetically pleasing), four more of the same hidden in my closet, a shelf of reading material in my bathroom, plus bookcases in each of my kids' rooms. It's more reassuring than I can tell you to see someone else, someone I respect, with books EVERYWHERE. Ding dong, the taxes are done! Let's do UPDATES!